W.C.A. Services Corporation has been providing health related business services for over 30 years. Our EMS service, through the ALSTAR EMS and Starflight divisions, have provided medical transportation both emergent and non-emergent to over 400,000 patients since inception. 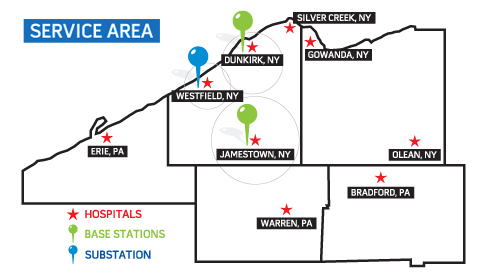 Our state of the art ALSTAR EMS Training Center provides EMS educational opportunities ranging from standard CPR classes to the Western New York Regional Paramedic Program through distance learning. Additionally, our Health Care Practice Management division provides physicians' with professional billing services, including coding and credentialing. Our management team has over 175 years of combined experience in emergency medical services and the medical transportation industry. Whether it is our Communications Center, paramedics/EMT’s in the field, or the customer service representatives in the billing services, our team is dedicated to serving you. It has been a pleasure serving our facilities and communities.